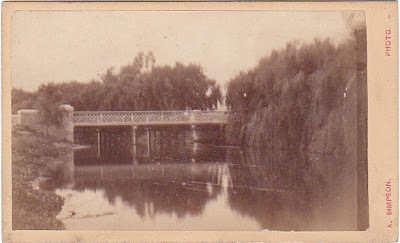 Oxford Terrace will show a light to both approaches of the bridge. 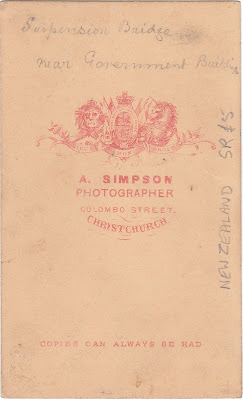 It is yet to be established who the photographer A. Simpson was. A possible candidate is Alfred Simpson a bookseller and publisher in High Street. In 1861 Alfred Simpson is living at North Street, Reigate with his wife Emily and three children twins aged four years and a daughter aged two years. Alfred Simpson was then aged 35 years employed as a clerk to a bookseller. Author: M. Mosley. Publication details: J. T. Smith & Co., 1885. 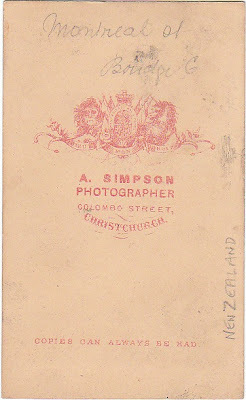 Simpson and Williams, Limited, Booksellers, Stationers, Publishers, and News Agents, 214 High Street, Christchurch. 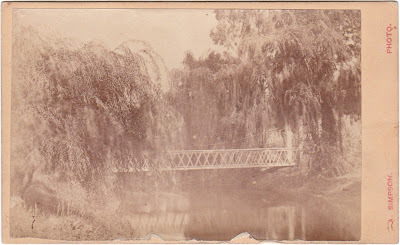 Established in 1862 by Mr. J. T. Hughes who was succeeded in 1878 by Mr. Alfred Simpson. Mr. J. S. Williams, who had been associated with the business from 1864, joined the firm in 1886 when the style was altered to Simpson and Williams. In the following year Mr. Simpson retired and his son, Mr. E. Y. Simpson, became a partner, the business being incorporated as a limited liability company in 1893, for family reasons. The firm is a direct importer of all lines and holds an immense up-to-date stock of the latest productions. It is agent in Canterbury for Messrs Gordon and Gotch, and for the Society for Promoting Christian Knowledge, and makes a special feature of importing English books and newspapers. As publishers, Messrs Simpson and Williams have successfully issued several works.